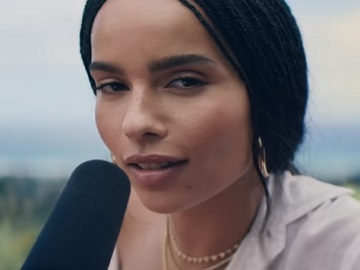 Michelob ULTRA has tapped Zoë Kravitz to introduce Michelob ULTRA Pure Gold, a USDA Certified Organic Light Lager with 2.5 carbs and 85 calories. The actress stars in a 45-second commercial from agency FCB Chicago, which marks the brand’s second commercial for this year’s Super Bowl, whispering a message about the Michelob ULTRA Pure Gold in the hopes to trigger ASMR (autonomous sensory meridian response) for viewers. “Let’s all experience something together,” she says, looking straight to the camera, while behind her a stunning landscape, featuring green forests, mountains and a rocky waterfall, is seen. “This place, so pure, you can feel it. This beer, so pure you can taste it,” she also whispers, pouring a Michelob ULTRA Pure Gold into a glass. “Beer in its organic form,” Kravitz adds at the end of the commercial, which was directed by Emma Westenberg, who previously directed Janelle Monae’s PYNK music video. In its first commercial for this year’s Super Bowl, the beer brand features Maluma enjoying a beer with his friends, while one of the robots that live among humans is watching the group through the window of a bar, from the sidewalk, and realizes that “It’s only worth it, if you can enjoy it.” The ad also informs that this superior light beer has no artificial colors or flavors, and only 2.6 carbs and 95 calories. Last year, the brand enlisted actor Chris Pratt to star in its commercial for the Big Game, which saw him portraying an overconfident actor under the delusion that he’s the most important player in an upcoming Super Bowl ad.